If you spend much time around tartans, as I have, you begin to recognize that the scale of the pattern differs greatly. Some, like Rob Roy, are small, some, like Royal Stewart are quite large. This can be a real challenge in selecting a tartan to stitch. Since it’s the relative size of the stripes that makes a tartan distinctive, the more stripes there are before a repeat of the pattern, the bigger the scale is. In addition, the width of the narrowest stripe determines the width of all the other stripes. This isn’t an issue in woven plaids because the threads are so narrow in comparison to the cloth itself. But it is important in needlepoint. Using the Texas Blue Bonnet plaid as my example, my narrowest stripe is one thread wide, as is often the case with my charted plaids, the whole sett is 46 threads wide. This is an excellent size for most needlepoint. It works in many mesh sizes, will allow repeats and lets you choose where to center the plaid. If I made my narrowest stripe two threads instead of one, the sett would be 92 threads wide. That’s over 5 inches on 18 mesh! Fine for a pillow, but not for anything smaller. 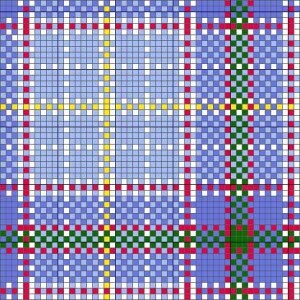 Every tartan and plaid I chart is done with the practical aspects of needlepoint in mind. They are selected and charted so that they will work in most needlepoint applications. If you have a special need that requires a different scale, just ask, I’m happy to help you plan out your project. Next Post: How Will I Use my Plaid? 30 years ago my mother needlepointed a footstool covering in the MacKay plaid. She would like to do another one, but needs guidance on the pattern. Have you done any of that plaid? Hello! I have been searching high and low for needlepoint tartans for my mom. She needlepoints and would love to do here family tartans: McIntosh, and MacLeod. Preferrably just like a 5×7 canvas. Can you help??? I am doing a piece with the royal Stewart hunting plaid with thistle and leaves in a size of 8 x 10. When that is finished and framed, I would like to do 4 smaller plaids with the Russell, Cameron, Healey and Brown tartans. They would each be about 6 x 6 and after framed, all 5 pieces would hang together. Can you help me out with the smaller plaids?